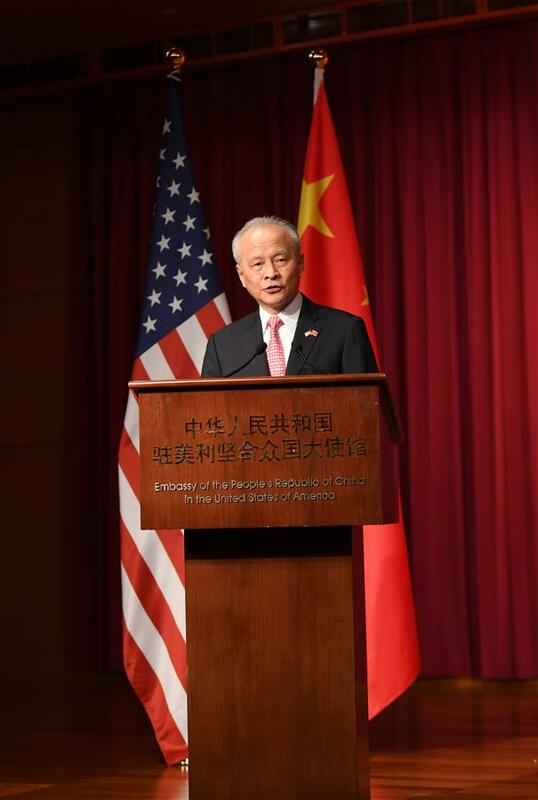 Chinese Ambassador to the United States Cui Tiankai on Wednesday called for more cooperation between China and the United States as their diplomatic ties reached its 40th anniversary. Addressing a reception for the anniversary of China-U.S. diplomatic relations and the Chinese New Year at the Chinese embassy, Cui said history has proven that cooperation serves the interest of both countries. "The past 40 years have proved that cooperation is in the interests of both countries while confrontation hurts both," Cui said, adding "there is no better option for us than cooperation." Cui said cooperation is not only essential for both countries but for the world, adding that overcoming the global financial crisis and finding a political solution to the situation on the Korean Peninsula are two success stories where the two countries worked side by side. "New global challenges keep coming up. More than ever before, the world needs China and the U.S. to work together," Cui said. Acknowledging the differences between China and the United States, Cui said both countries "need to properly handle differences." "We need to respect each other's independent choice of social systems and paths of development, and accommodate each other's core interests and concerns," Cui said, adding that "whether on economic or security issues, we can always find a way out if we address the differences with candor and good faith, based on mutual respect and common interest." Cui warned that talks of "decoupling" China and the United States would be disastrous for the world economy, pledging that "China will open its door wider to the United States and look forward to more cooperation at various levels." "We are the two largest economies in the world. Each has its own strengths. Each is complementary to the other. Both have much greater opportunities if we stay open to each other. Both will be much more prosperous if we cooperate with each other," Cui said. Cui also called on the two countries to promote mutual understanding, stay open to each other, step up people-to-people exchanges and get more connected. Former U.S. Secretary of Commerce Carlos Gutierrez, who attended the event, resonated with Cui's words, saying that he "can't conceive" that both country would "decouple." "We are so integrated that to think of a world where China is on its own and the United States is on its own, I can't conceive that," he said. National Security Council Senior Director for Asian Affairs Matt Pottinger, also at the event, said he was "delighted to be celebrating 40 years of official ties" and that he was "looking forward to a productive and prosperous relationship." Approximately 750 guests attended the reception, including U.S. Secretary of Commerce Wilbur Ross and a number of U.S. lawmakers. The guests were able to wander through an exhibition of photos documenting the 40 years of China-U.S. relationship, and were offered a taste of traditional Chinese culture as Chinese craftsmen demonstrated porcelain painting, costume making and displayed lion dance props.